A number of the stone houses built by Bishop Vesey in Sutton in the 1520s survive – there is one at Maney and another in Wylde Green Road. However, stone was not normally used for houses in Sutton Coldfield, most local buildings being timber-framed or, later, brick-built. Houses from before 1500 have not survived – those built of dried mud only lasted for 100 years, while the timber houses were prone to wet and dry rot, woodworm and death watch beetle, destruction by fire or severe storms. Houses built of cob – clayey subsoil mixed with straw – were still to be found in the Midlands in 1800, so there would probably have been some in Sutton in the Middle Ages, but most houses built after about 1200 were cruck-framed. A cruck consisted of giant A-frames made from the two halves of a single oak tree split down the middle; a typical house would be made up of four crucks joined together with lengthwise timbers, the space between two crucks being a bay. Two bays of a three-bay house formed the main room or hall, the other housing the parlour and buttery. A wealthy man’s house would be on a larger scale with extra bays. Most of the houses in Sutton in 1500 would have been such three-bay cruck houses, where the single-storey house was heated by a wood fire on a hearth in the centre of the hall. The hall was open to the roof, and the smoke escaped through vents in the thatch, so the stone houses built by Bishop Vesey were revolutionary – not only in the material and method of construction, but also because they all had hearths with chimneys and a staircase leading to an upper floor. 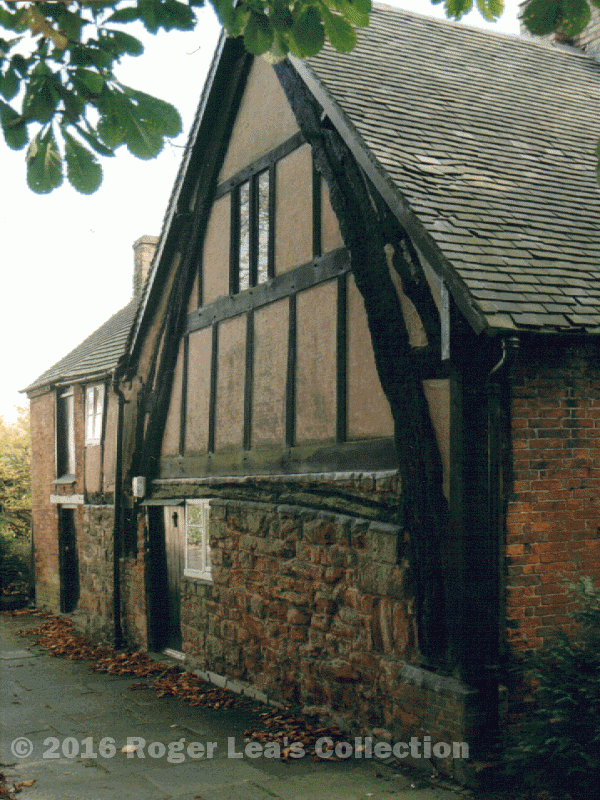 Cruck houses were abandoned in the sixteenth century by those who could afford it. They were replaced by box-frame houses which were similar in construction, often of three bays, but the hearths had chimneys to carry away the smoke, allowing the addition of one or more upper storeys. Such houses could easily be extended with wings – one of the largest houses in Sutton, the Tudor Rectory which was demolished in 1701, had twenty-two bays. Structural timber came from oak trees growing in Sutton woods, giving a plentiful supply of three- or four-metre long beams suitable for small houses, but the stronger six- or seven-metre beams required for the larger rooms of higher-status houses were not so common. 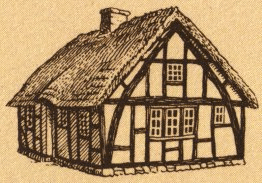 Artist’s impression of a three-bay cruck house. The exposed cruck at the back of the Driffold Gallery (the Old Smithy) in Birmingham Road.